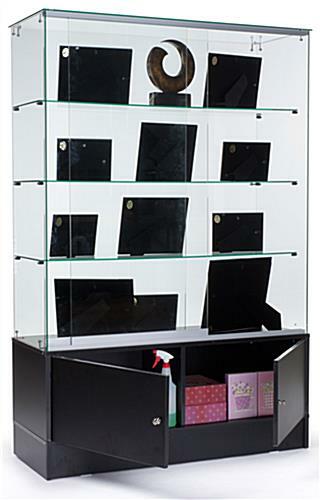 Merchandisers utilize the open design of this freestanding display case to increase product visibility in any retail environment. 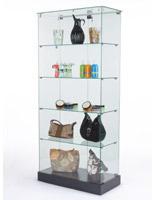 With a high-end, frameless, design this glass showcase features quality construction at an affordable price point. 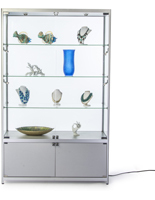 This frameless fixture maximizes exposure by enabling customers to view merchandise from all multiple angles without aluminum or wooden edges obscuring their view. 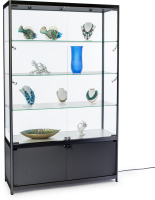 Small aesthetic choices such as utilizing these freestanding display cases will improve the overall ambiance of any business. 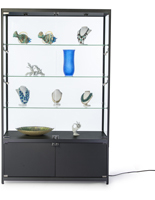 Retailers, schools, and various other businesses use these fixtures to showcase trophies, antiques, electronics, and high-end specialty products. 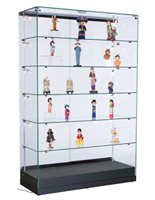 We use shatter-resistant tempered glass in the construction of our display cases, which will break into rounded pieces if an accident does occur. 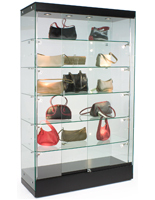 Small metal connectors hold the glass panels and shelving together, removing the chance of obstructing product views. This model features sliding doors with a lock and key system as well as bottom loading storage cabinets. 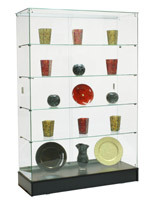 Each glass showcase ships unassembled, saving customers money on shipping cost. Assembly is quick and simple. Typically two adults can unpack, build, and make this display ready for the sales floor in 25 minutes or less. Please note: The base cabinet does not lock. Daniel, thank you so much for taking the time to share your feedback with us. 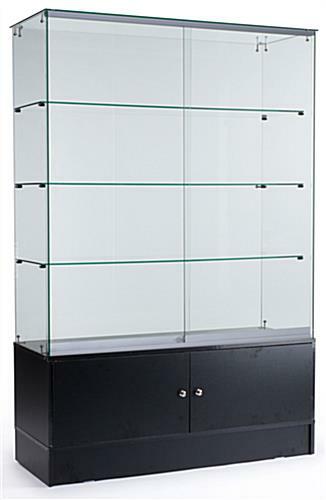 We're glad that you like the display case itself, but regret that you found the instructions to be difficult to follow. We produced an assembly video that customers have found helpful, but we'll have our team review the print instructions to see how we can improve. Thanks again! With the exception of the freight company (which is independent from Display2go), I am very happy with this case. It's extremely sturdy and looks amazing. Thanks for the great review, Marilyn! We hope you shop with us again soon. 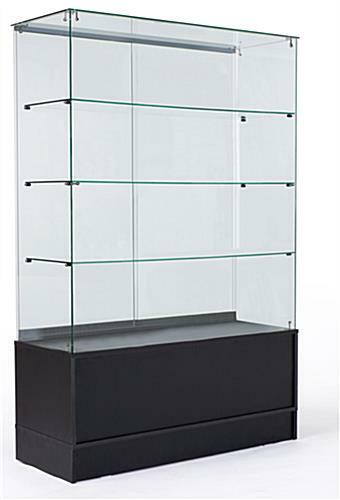 We bought this display case to house a heavy trophy and other awards/plaques. It is very sturdy, and can support a lot of weight. It was also pretty easy/quick to assemble. Overall, we are very satisfied with this purchase. Case is just as described. Instructions could have been easier to understand and more complete. Very pleased with case once it was assembled.